Flour Tortillas, originally uploaded by All Things Mimi. You are looking at the very first ever batch of flour tortillas I've ever made. They came out pretty well. Put flour, shortening and salt in a mixer and beat with the paddle attachment until crumbly. The recipe said it would take 3-5 minutes, but it didn't take that long for mine. With the mixer running, slowly add the water and mix until the dough is smooth. Take the dough out of the mixer and shape into small balls. Mine were like golf ball sized, but the resulting tortillas were small. If you want bigger tortillas, make the balls bigger. I think it is mostly trial and error. Put the dough balls on a tray and cover with a damp cloth. Let them sit at least 15 minutes. Hmmm those tortillas look really good. 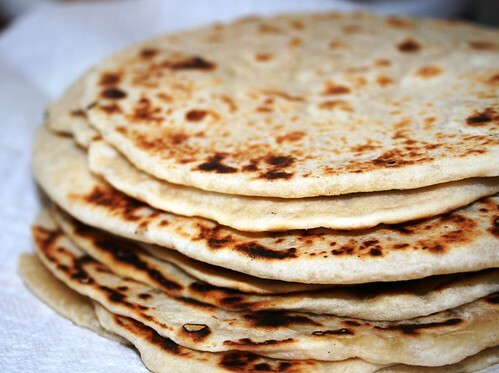 I wish I could make flour tortillas like this. That was amazing! How did she work over that fire without burning her fingers off? And the tortilla was so thin and delicate!! Thanks loulou! If I can do it anybody can! The flour ones are much easier- in my opinion, anyway.